President Donald Trump today will formally propose to Congress a 17% year-over-year reduction in the NIH budget, as well as a 68% hike in user fees the FDA would collect from drug and diagnostic developers to review their applications, under a spending plan that at least one key member of Congress said is unlikely to pass as submitted. While the budget is set for formal release at 11 a.m. ET, a portion of the proposal affecting agencies of the U.S. Department of Health and Human Services—Putting America’s Health First: FY 2018 President’s Budget for HHS—was inadvertently posted online yesterday and made public by The Washington Post and some other national news outlets. 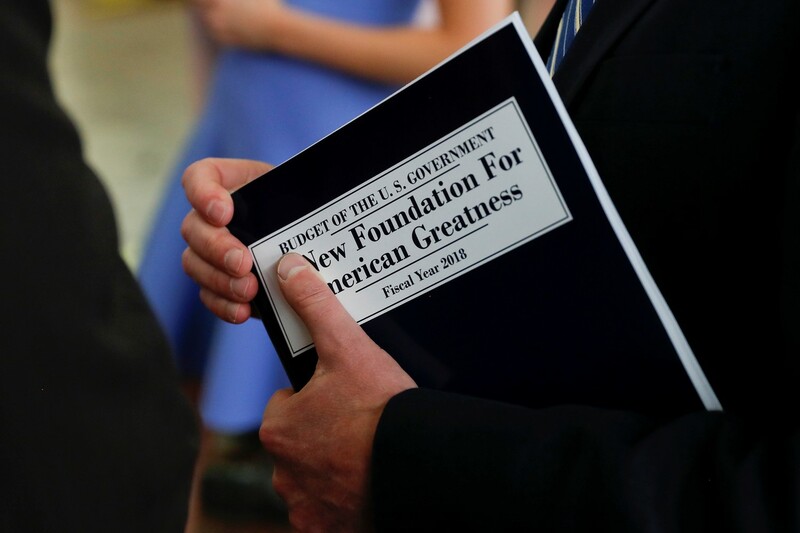 “The Department’s approach to budgeting this fiscal year puts the American people first by supporting fiscal discipline within the Federal Government and saving taxpayers a net estimated $665 billion over 10 years,” HHS stated. Trump’s budget for the 2018 federal fiscal year, which starts October 1, would reduce NIH program-level spending to $26.92 billion from $32.593 billion in the current federal fiscal year, down $5.673 billion or 17.4%. The largest cut in dollars would be made at the largest of NIH’s 27 centers and institutes. The National Cancer Institute (NCI) would see its budget shrink $1.031 billion, or 18.7%, to $4.474 billion. The second largest cut would come at the National Institute of Allergy and Infectious Diseases (NIAID), which would see $838 million, or 18% less, in FY 2018, reducing its budget to $3.783 billion. As proposed in a budget outline or “Blueprint” unveiled in March, the Trump administration would also eliminate the Fogarty International Center, whose activities include facilitating global health research by U.S. and international investigators and training scientists to address global health needs, for a stated savings of $70 million. Instead, the proposed spending plan sets aside $25 million for “mission-critical international research and research related activities” within the budget of NIH’s Office of the Director. At least one key Congressional Republican said the proposed cuts for NIH are likely to meet the same failed fate as the Trump administration’s proposed immediate $1.2 billion proposed cut for the agency for the current fiscal year. Congress instead responded earlier this month by increasing NIH’s budget by 6%, or $2 billion, for the remainder of the current federal fiscal year. “I can say NIH will remain a priority in my budget, and we’re going to do everything we can to stay on the course we’re on—which is predictable and modest increases in funding,” Rep. Tom Cole (R-OK), chairman of the Appropriations Subcommittee on Labor, Health and Human Services, Education, and Related Agencies, told Vox. For the FDA, the proposed budget would increase user fees by $1.306 billion or 68% from FY 2017, to $3.223 billion, accounting for nearly two-thirds of the agency’s total budget, up from 42.5% in FY 2016. Prescription drug developers would face $508 million in new fees, which would rise from $755 million to $1.262 billion. Medical device user fees—a category that includes diagnostics—would more than triple, from $126 million to $429 million. Higher user fees may similarly be doomed, Sen. Lamar Alexander (R-TN), who chairs the Senate’s Committee on Health, Education, Labor, and Pensions, told HHS Secretary Tom Price in a letter that the user fee hikes were “an interesting proposal” but “way too late to have an impact on this year's agreements, which have been negotiated over the last 2 years” with biopharma and other FDA-regulated industries, The Wall Street Journal reported. FDA’s total program-level spending would rise by $456 million or nearly 10%, to $5.116 billion, mostly due to increases in salaries and expenses; spending on programs affecting human drugs would see the largest increase of $287 million, up to $1.612 billion. For CDC, the Trump administration’s proposed budget would slice program-level spending by $1.038 billion or 8.6%, to $11.059 billion. The largest spending reduction planned for the CDC, $222 million, would come to the agency’s Chronic Disease Prevention and Health Promotion effort, which would shrink to $952 million, followed by a cut of $186 million or 16.6% to CDC’s HIV/AIDS, viral hepatitis, sexually transmitted infections, and TB prevention efforts, which would be reduced to $934 million.